See in Glossary, so you can adjust any settings to apply to different Assets in your Project. Scene-level properties, such as whether to import Lights and Cameras, and what scale factor to use. Geometry-related properties, for dealing with topology, UVs, and normals. Scale Factor Set this value to apply a global scale on the imported Model whenever the original file scale (from the Model file) does not fit the intended scale in your Project. Unity’s physics system expects 1 meter in the game world to be 1 unit in the imported file. 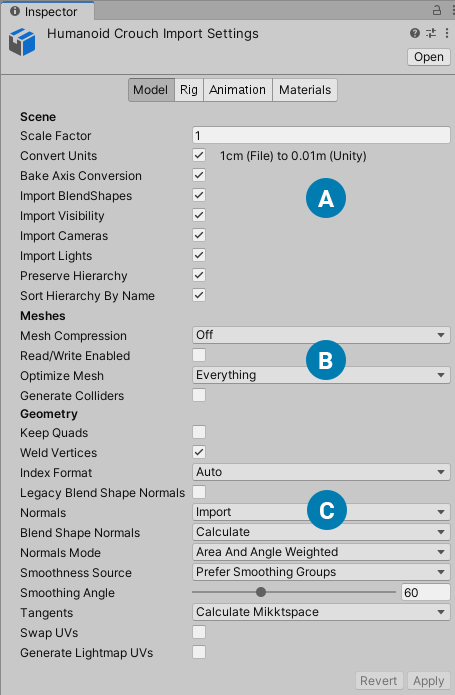 Convert Units Enable this option to convert the Model scaling defined in the Model file to Unity’s scale. Import BlendShapes Allow Unity to import BlendShapes with your Mesh. Note Importing blendshape normals requires smoothing groups in the FBX file. Import Visibility Import the FBX settings that define whether or not MeshRenderer components are enabled (visible). See Importing Visibility below for details. Import Cameras Import cameras from your .FBX file. See Importing Cameras below for details. Import Lights Import lights from your .FBX file. See Importing Lights below for details. Preserve Hierarchy Always create an explicit prefab root, even if this model only has a single root. Normally, the FBX Importer strips any empty root nodes from the model as an optimization strategy. However, if you have multiple FBX files with portions of the same hierarchy you can use this option to preserve the original hierarchy. For example, file1.fbx contains a rig and a Mesh and file2.fbx contains the same rig but only the animation for that rig. If you import file2.fbx without enabling this option, Unity strips the root node, the hierarchies don’t match, and the animation breaks. See in Glossary can enable or disable MeshRenderer components by controlling the Renderer.enabled property. See in Glossary is set to 0, all of the renderers on its children are also disabled. In this case, one animation curve is created for each child’s Renderer.enabled property. Projection mode Orthographic or perspective. Does not support animation. Field of View Supports animation. All Physical Camera properties If you import a Camera with Physical Properties (for example, from from Maya), Unity creates a Camera with the Physical Camera property enabled and the Focal Length, Sensor Type, Sensor Size, Lens Shift, and Gate Fit values from the FBX file. Note: Not all 3D modeling applications have a concept of Gate Fit. When not supported by the 3D modeling application, the default value in Unity is None. See in Glossary distance Unity does not import any animation on these properties. When exporting from 3ds Max, enable the Clip Manually setting; otherwise the default values are applied on import. Target Cameras If you import a Target Camera, Unity creates a camera with a LookAt constraint using the target object as the source. Range The FarAttenuationEndValue is used if UseFarAttenuation is enabled. FarAttenuationEndValue does not support animation. Spot Angle Supports animation. Only available for Spot lights. Note: In 3ds Max, the exported default value is the value of the property at the current selected frame. To avoid confusion, move the playhead to frame 0 when exporting. Some 3D modeling applications apply scaling on light properties. For instance, you can scale a spot light by its hierarchy and affect the light cone. Unity does not do this, which may cause lights to look different in Unity. The FBX format does not define the width and height of area lights. Some 3D modeling applications don’t have this property and only allow you to use scaling to define the rectangle area. Because of this, area lights always have a size of 1 when imported. Targeted light animations are not supported unless their animation is baked. Mesh Compression Set the level of compression ratio to reduce the file size of the Mesh. Increasing the compression ratio lowers the precision of the Mesh by using the mesh bounds and a lower bit depth per component to compress the mesh data. It’s best to turn it up as high as possible without the Mesh looking too different from the uncompressed version. This is useful for optimizing game size. Low Use a low compression ratio. Medium Use a medium compression ratio. High Use a high compression ratio. Read/Write Enabled When this option is enabled, Unity uploads the Mesh data to GPU-addressable memory, but also keeps it in CPU-addressable memory. This means that Unity can access the mesh data at run time, and you can access it from your scripts. For example, if you’re generating a mesh procedurally, or if you want to copy some data from a mesh. When this option is disabled, Unity uploads the Mesh data to GPU-addressable memory, and then removes it from CPU-addressable memory. In most cases, you should disable this option to save runtime memory usage. For information on when to enable Read/Write Enabled, see Mesh.isReadable. Optimize Mesh Let Unity determine the order in which triangles are listed in the Mesh. Unity reorders the vertices and indices for better GPU performance. See in Glossary Mesh for environment geometry, but should be avoided for geometry you are moving. Keep Quads Enable this to stop Unity from converting polygons that have four vertices to triangles. For example, if you are using Tessellation Shaders, you may want to enable this option because tessellating quads may be more efficient than tessellating polygons. Unity can import any type of polygon (triangle to N-gon). Polygons that have more than four vertices are always converted to triangles regardless of this setting. However, if a mesh has quads and triangles (or N-gons that get converted to triangles), Unity creates two submeshes to separate quads and triangles. Each submesh contains either triangles only or quads only. Tip: If you want to import quads into Unity from 3ds Max, you have to export it as an Editable Poly. Weld Vertices Combine vertices that share the same position in space, provided that they share the same properties overall (including, UVs, Normals, Tangents, and VertexColor). This optimizes the vertex count on Meshes by reducing their overall number. This option is enabled by default. In some cases, you might need to switch this optimization off when importing your Meshes. For example, if you intentionally have duplicate vertices which occupy the same position in your Mesh, you may prefer to use scripting to read or manipulate the individual vertex and triangle data. Index Format Define the size of the Mesh index buffer. Note: For bandwidth and memory storage size reasons, you generally want to keep 16 bit indices as default, and only use 32 bit when necessary, which is what the Auto option uses. Auto Let Unity decide whether to use 16 or 32 bit indices when importing a Mesh, depending on the Mesh vertex count. This is the default for Assets added in Unity 2017.3 and onwards. 16 bit Use 16 bit indices when importing a Mesh. If the Mesh is larger, then it is split into <64k vertex chunks. This was the default setting for Projects made in Unity 2017.2 or previous. See in Glossary complexity, because they only need to handle one format. See in Glossary Defines if and how normals should be calculated. This is useful for optimizing game size. Import Import normals from the file. This is the default option. If the file doesn’t contain normals, they will be calculated. Calculate Calculate normals based on Normals Mode, Smoothness Source, and Smoothing Angle (below). None Disable normals. Use this option if the Mesh is neither normal mapped nor affected by realtime lighting. Blend Shape Normals Defines if and how normals should be calculated for blend shapes. Use the same values as for the Normals property. Normals Mode Define how the normals are calculated by Unity. This is only available when Normals is set to Calculate or Import. See in Glossary imported before the migration of the Project to the latest version of Unity. Unweighted The normals are not weighted. Area Weighted The normals are weighted by face area. Angle Weighted The normals are weighted by the vertex angle on each face. Area and Angle Weighted The normals are weighted by both the face area and the vertex angle on each face. This is the default option. Smoothness Source Set how to determine the smoothing behavior (which edges should be smooth and which should be hard). Prefer Smoothing Groups Use smoothing groups from the Model file, where possible. From Smoothing Groups Use smoothing groups from the Model file only. From Angle Use the Smoothing Angle value to determine which edges should be smooth. None Don’t split any vertices at hard edges. Smoothing Angle Control whether vertices are split for hard edges: typically higher values result in fewer vertices. Note: Use this setting only on very smooth organics or very high poly models. Otherwise, you are better off manually smoothing inside your 3D modeling software and then importing with the Normals option set to Import (above). Since Unity bases hard edges on a single angle and nothing else, you might end up with smoothing on some parts of the Model by mistake. Only available if Normals is set to Calculate. TangentsOne of two handles that controls the shape of the animation curve before and after a key. Tangents appear when a key is selected in the Curves view, or when a key is selected in the Curve Editor. See in Glossary Define how vertex tangents should be imported or calculated. This is only available when Normals is set to Calculate or Import. Import Import vertex tangents from FBX files if Normals is set to Import. If the Mesh has no tangents, it won’t work with normal-mapped shaders. Calculate Tangent Space Calculate tangents using MikkTSpace. This is the default option if Normals is set to Calculate. Calculate Legacy Calculate tangents with legacy algorithm. Calculate Legacy - Split Tangent Calculate tangents with legacy algorithm, with splits across UV charts. Use this if normal map lighting is broken by seams on your Mesh. This usually only applies to characters. None Don’t import vertex tangents. The Mesh has no tangents, so this doesn’t work with normal-mapped shaders. See in Glossary. Unity supports up to eight UV channels but not all 3D modeling applications export more than two. Generate Lightmap UVs Creates a second UV channel for Lightmapping. See documentation on Lightmapping for more information.